The PSL Rheotek automatic ink viscometer system is suitable for measuring Dye and pigment inks. The system is supplied with four measuring positions, three cleaning solvents and a specially developed glass capillary viscometer tube. The RPV-1 automates the manual steps set out in standard methods, minimizing the variability of results. Cleaning is carried out in-situ utilizing three solvents and a safe vacuum system. ASTM D2857 Determination of the dilute solution viscosity of polymers. 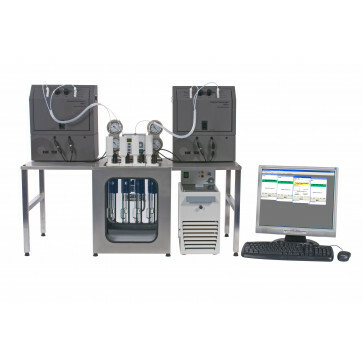 PSL Rheotek Ink Viscometer – four positions complete with viscometer bath, chiller, control module, four measuring heads, four filling stations, PC control system and PIAB vacuum system.